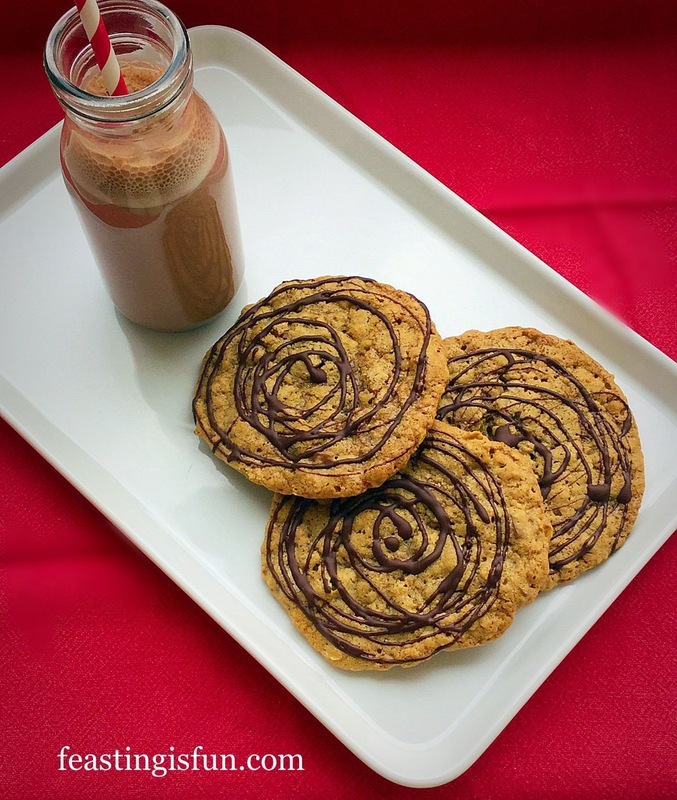 Today I have a delicious cookie recipe for you. While it’s flavours are based on the classic coffee and walnut cake, there is also an added twist. 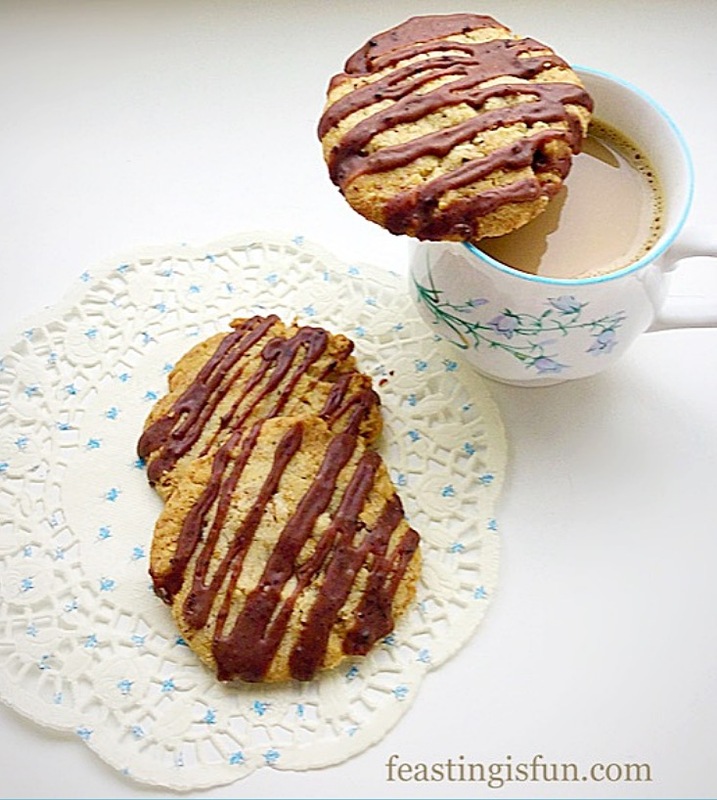 So these Camp Coffee Walnut Cookies with a mocha drizzle are the perfect accompaniment to your morning, afternoon, anytime, cup of coffee. 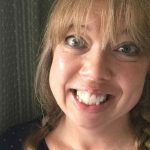 So, do you remember Camp Coffee? While I used to have a splash of it in hot milk when I was younger, other than that I can’t remember seeing it around for the last 20 years or so. Although maybe I just wasn’t looking! Camp coffee is made using chicory extract. So the leaves that you add to your salad are also used to make this product. Another added benefit is that it contains 4% coffee extract, which means although not caffeine free, it has lower levels than regular coffee, without compromising flavour. Because it is already in liquid form, Camp coffee is very easy to use, as a coffee substitute in many recipes. Including cookies, cakes, this Camp Coffee Ice Cream and different types of icing. 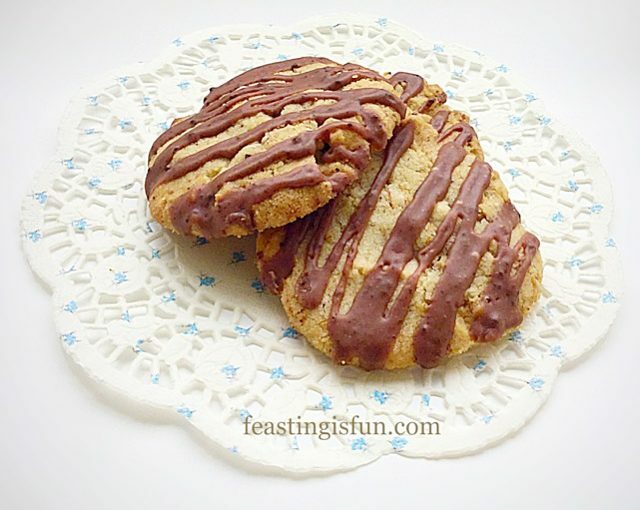 While Camp Coffee Walnut Cookies are very crisp, you can confidently bite into one without the cookie crumbling apart. And the mocha drizzle adds just the right amount of chocolate/coffee sweetness, however, you can easily leave it off if you are watching your sugar intake. Since the recipe makes approximately 10 cookies I strongly suggest making a double batch. And take them in to work, to share with your colleagues over morning coffee. Also you can ask if anyone remembers the, oh-so-familiar bottle? First of all line 2 baking trays with non stick silicone mats or baking parchment. In a medium size bowl add the butter, sugar and salt. Add the Camp coffee and vanilla extract. Whisk/beat to combine. Process the 40g of walnuts either in a food processor or mini chopper, until they are finely ground and resemble ground almonds. 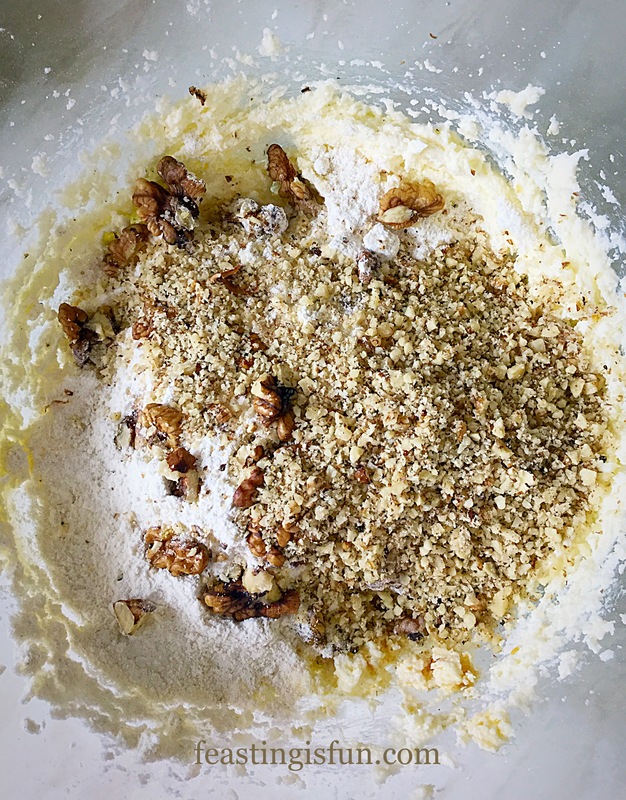 Add the flour, ground walnuts and walnut pieces to the bowl. 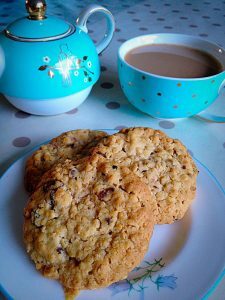 The ground walnuts really add to the nutty flavour and crisp texture of this cookie. Use a spoon to stir and bring all the ingredients together. Divide the mixture into ten and roll into balls. Place the cookie dough balls on to the baking tray. Press down to flatten the balls into discs. 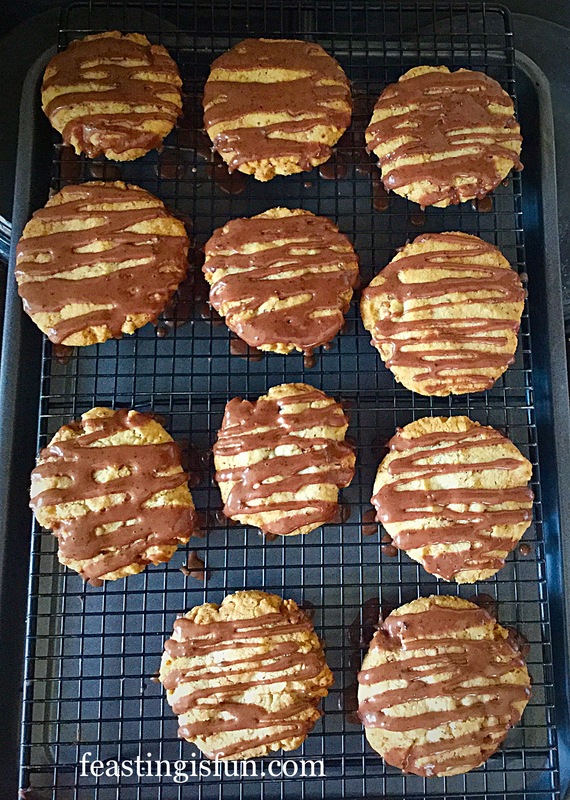 Camp Coffee Walnut Cookies ready for the oven. 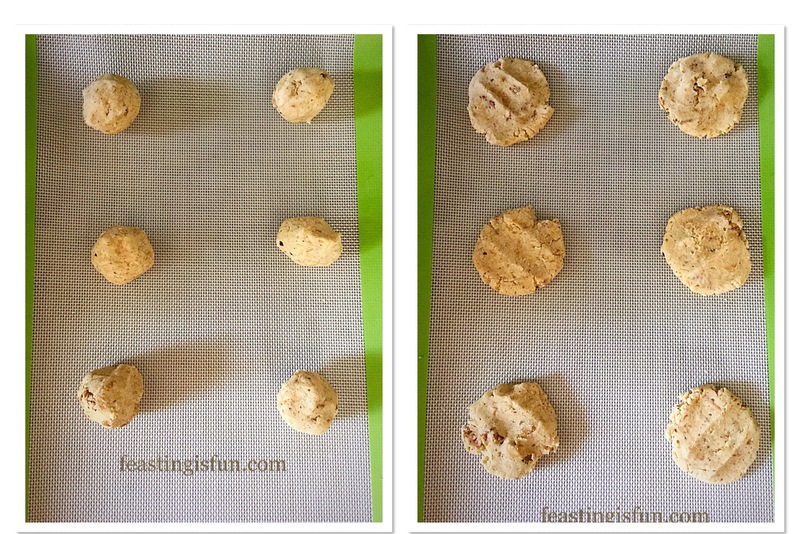 Place the baking trays evenly spaced apart in the oven and bake for 13-15 minutes. Turn the baking trays around halfway through baking. 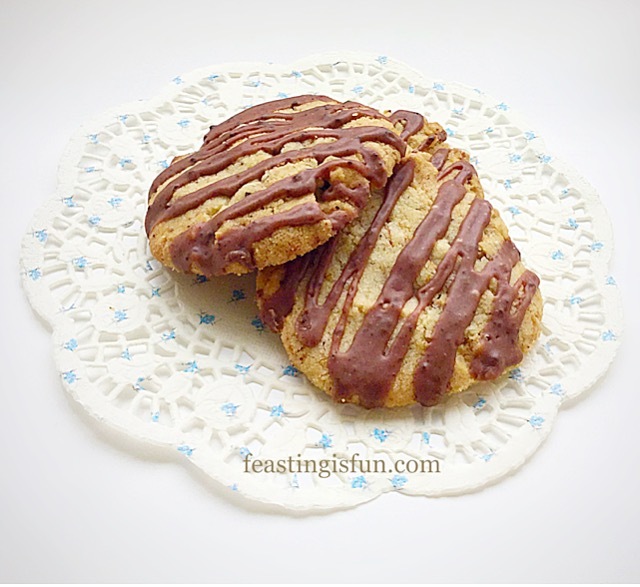 The Camp Coffee Walnut Cookies are baked when they are crisp and golden. As soon as the cookies are baked remove the baking trays from the oven and allow them to cool on the trays. Add the Camp coffee and vanilla extract. Next add 20mls of water and stir with a spoon adding the extra water, if needed, to make a thick icing that can be drizzled. 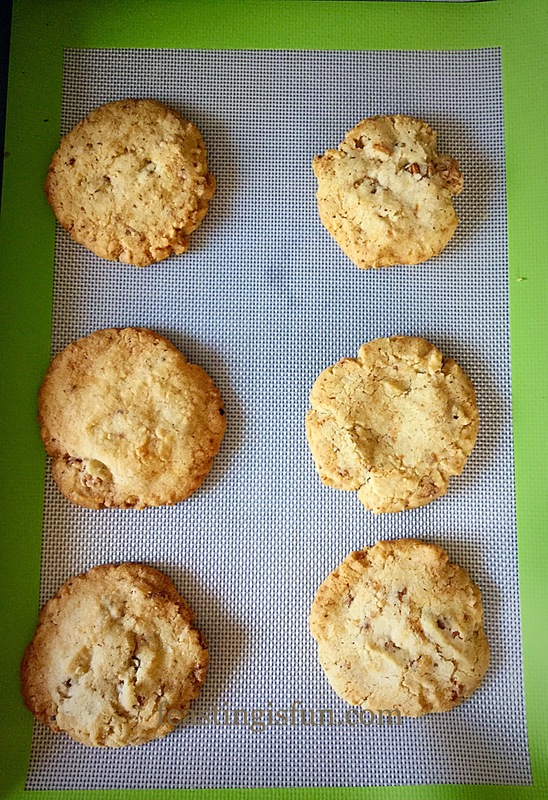 Place all of the cookies on a cooling rack that is placed over a large baking tray. Spoon the drizzle into a small disposable piping bag, alternately you can drizzle the icing over the cookies with a spoon. Snip the very end off of the piping bag and pipe zig zag lines across the cookies. 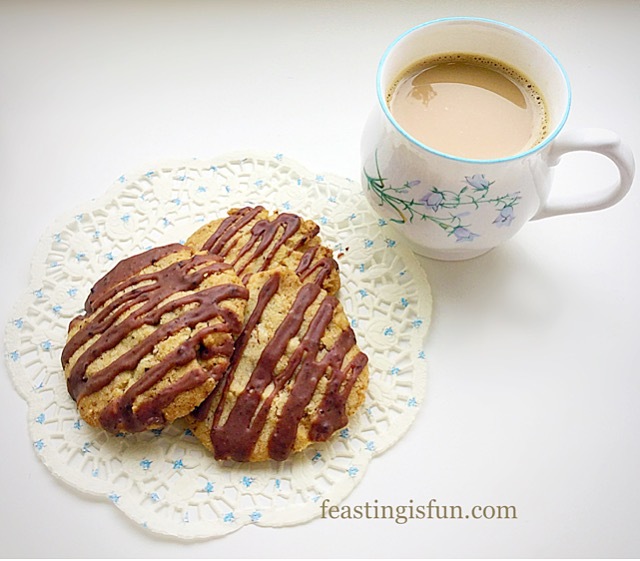 Finally, serve these delicious Camp Coffee Walnut Cookies, once the icing has set, with a drink of your choice. I am especially thrilled that these cookies withstand gentle ‘dunking’. Because in my house, dunking cookies makes them hat extra bit special. In addition to my family our post lady enjoyed one of these cookies when she delivered a parcel late this morning. I can see these disappearing fast, so next time I’ll make a double batch! Because we encourage sharing here at home baked treats can disappear quickly. And it’s always nice to surprise delivery people with a quick snack. Since I start everyday with a cup of tea and a cookie/biscuit (same difference!) these cookies are ideal. And with just enough sweetness to kickstart my body and not too much caffeine to overload my system. 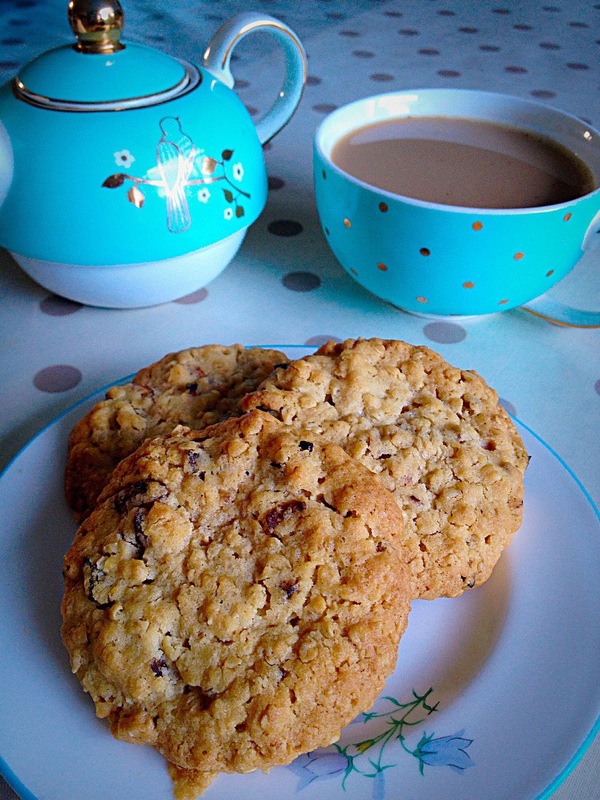 Since we I am a self confessed Cookie Monster, constantly trying new recipes. 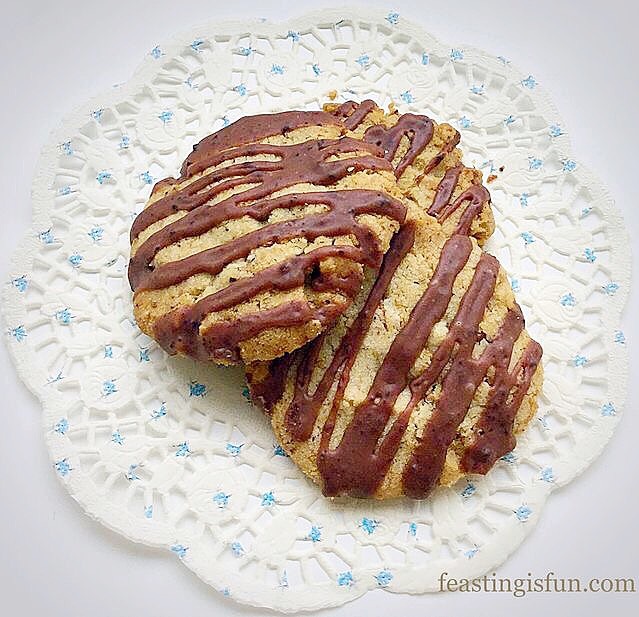 Although my preference is always for something nutty or with oats, so these Camp Coffee Walnut Cookies are perfect. Do you have a set way to start your day? 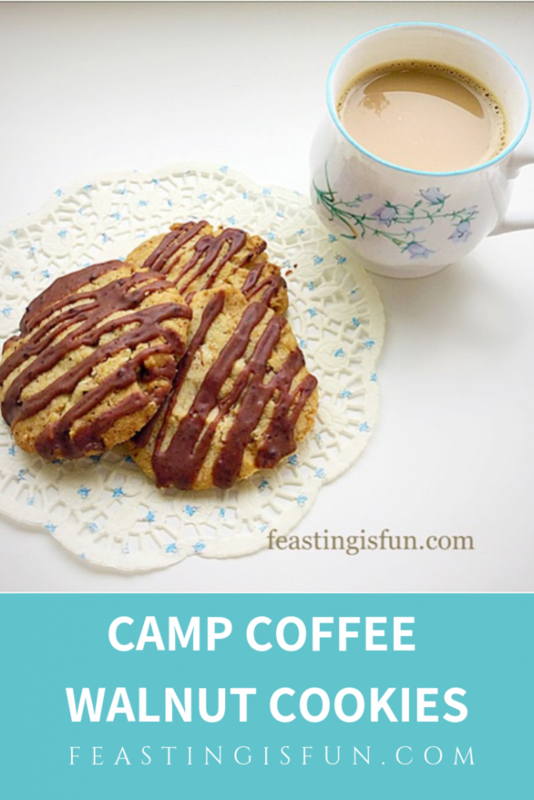 Camp Coffee Club provided me with the Camp Coffee to make this recipe. All views, opinions, content and photographs are my own and may only be reproduced with my permission. Please see my Disclosure Policy. PINNING! I love walnuts and always have them at the ready to add into muffins or chocolate chip cookies. I can’t wait to give these a try! I’ve never heard of Camp Coffee…I suppose I could substitute some instant coffee mixed with hot water (? ).